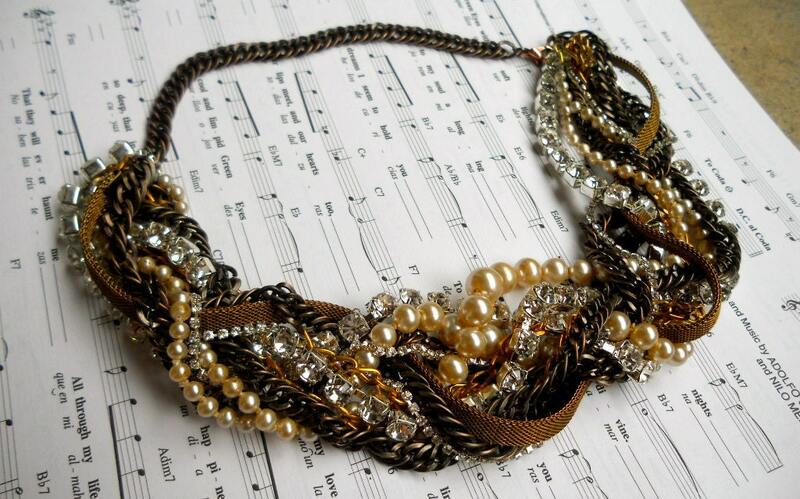 Binary Catfish: Assemblage; "How to Build a Better Necklace"
The art of assemblage has seen a major resurgence over the last decade or so, particularly in the "crafty" community. If you frequent Craftster, you have surely seen some amazing multimedia work, particularly in the Papercrafts and More Art, Less Craft categories. 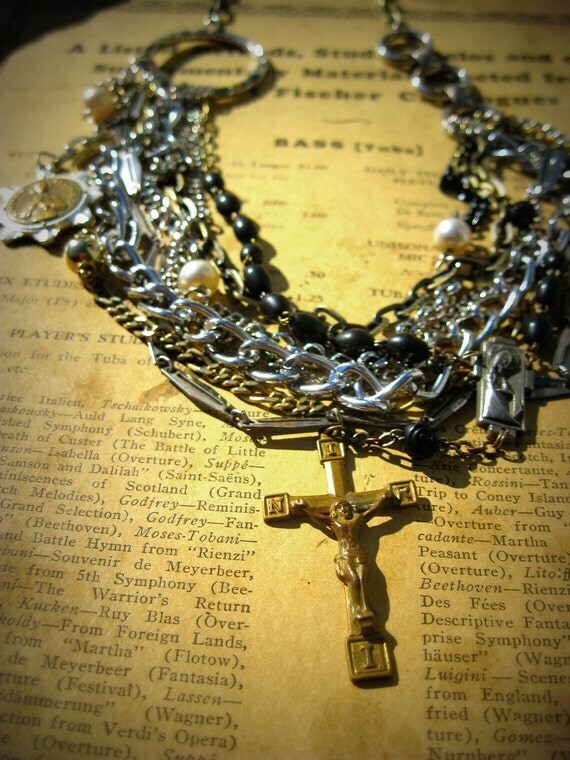 My favourite iteration of this art style is definitely in jewellery! Specifically, necklaces. This style has been a mainstream trend since 2009, but I notice that the "affordable" versions from such vendors as Forever21 and Target are made of cheap, potentially toxic materials, and are actually pretty boring as far as assemblages go. That's not to say that I don't own cheap, mass-produced, slightly-interesting neckwear. These cheap pieces have a place in my wardrobe, but it's so much more interesting to combine jewellery in unexpected ways! I've already shared the Monoxious tutorial for a Tom Binns style safety pin necklace, but here I'm going to focus more on how random elements put together can be chic and fresh, AND how to do a simple version on the cheap. What do these "good" examples of assemblage have in common? For one, they are very noticeable! But what exactly makes them noticeable??? I think the first attribute to discuss is the DENSITY of the materials. 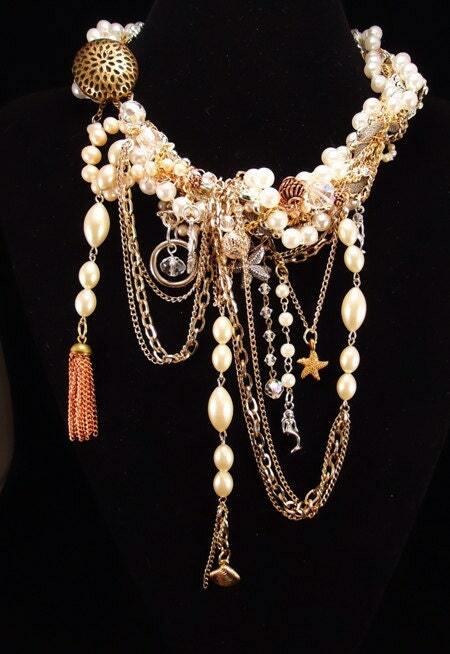 All of these necklaces have a lot of "stuff" packed into a relatively small space. 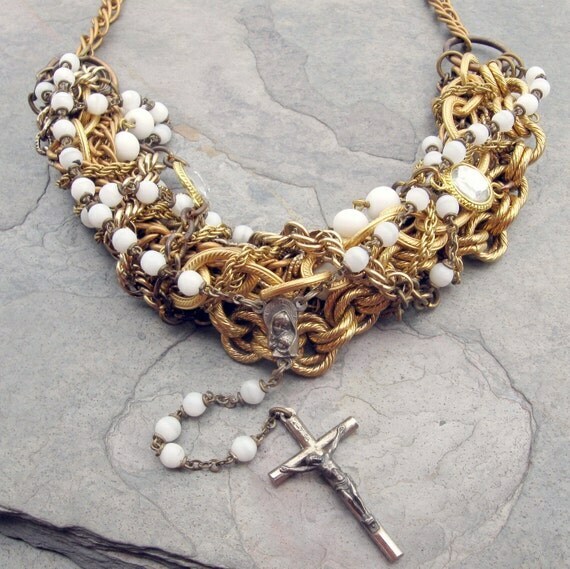 The second attribute of a good assemblage necklace is TEXTURE. Mixing different sizes/types of one material, and/or a variety of materials provides many different visual textures for the eye to take in, meaning a viewer would be likely to look at the piece longer than something that is unidimensional, or with visual textures that are all very similar to each other. The third and last attribute I'd like to mention here is COLOUR. Each of these pieces uses different coloured materials, but the finished result is harmonious. Depending on how you use colour, your piece will convey a different impression. There is a "cheap" way to get this look! This is not to say that these "cheap" pieces are unappealing, with no place in a sane woman's wardrobe, just that they take less imagination to assemble (which can be either good OR bad!). 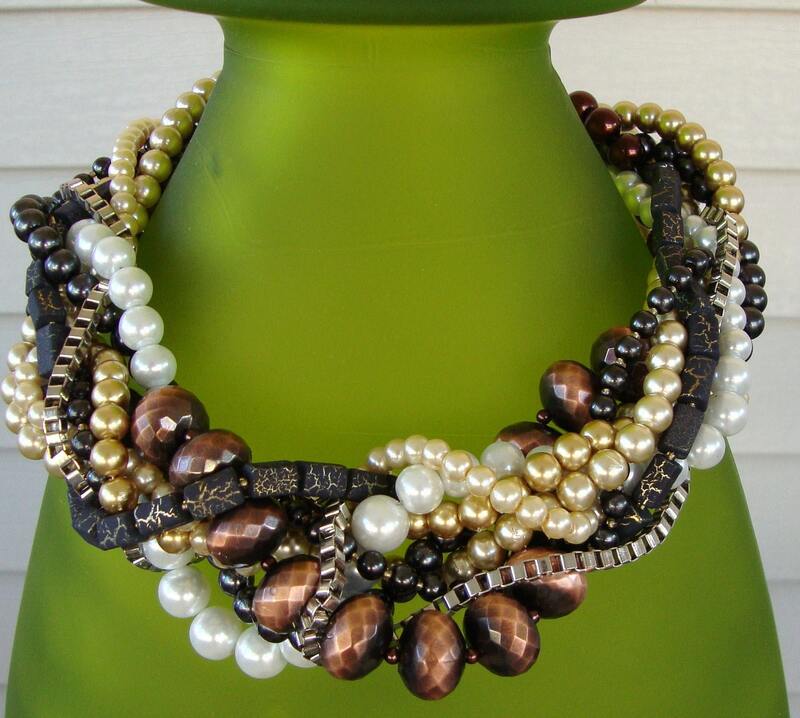 The easiest way to "cheat" at assemblage jewellery is to buy strands of beads at Michael's or WalMart, twist them together, and add a clasp. 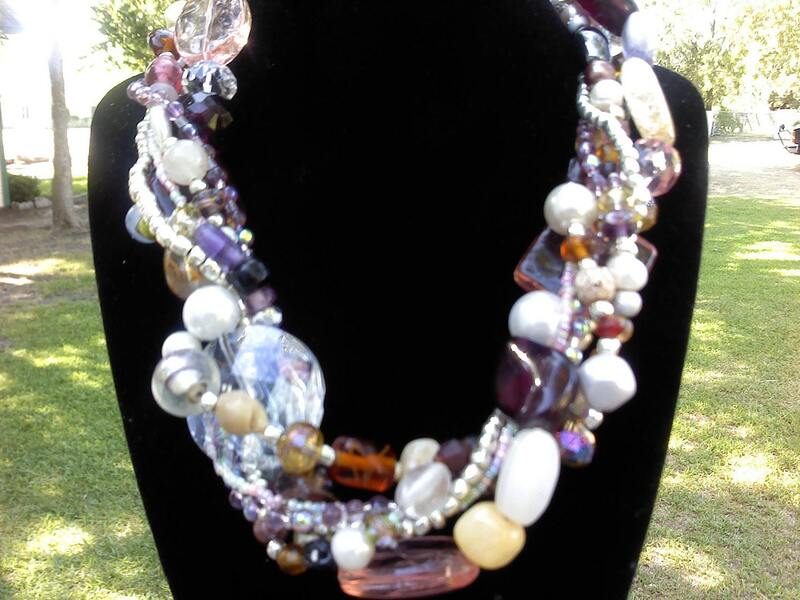 You can also scour the thrifts for simple necklaces, add your commercial bead strands, and there you have it. 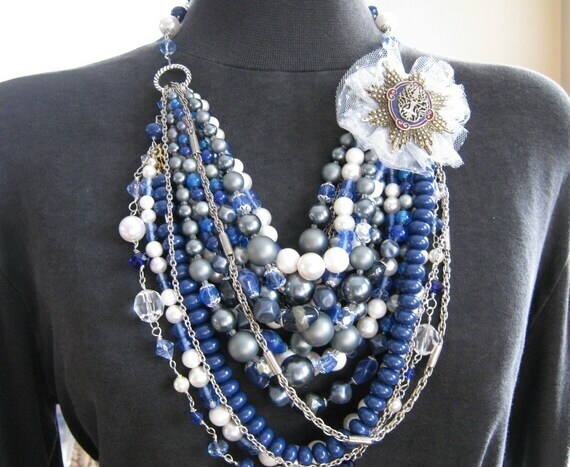 You might even have a few necklaces languishing in your drawers, just waiting to be combined with each other! If you follow the rules of density, texture and colour, you can still end up with an interesting piece. And becuase this post is long enough, I bid thee ADIEU!